Emily Penn, co-founder of community interest organisation eXXpedition and spokeswoman for Y.CO’s environmental initiative ‘#Clearwater’, sends a clear and profound message to superyacht owners about their obligation to protect our oceans. The ubiquitous nature of plastic waste is attracting increased attention on a global scale and has reached the stage where it can no longer be ignored. Discarded plastic can be found on beaches all over the world, and there is increasing scientific evidence of it in our food chains, from microplastics in our seafood to plastic microfibres in our tap water. My awareness of this problem began 10 years ago when I was woken in the middle of the night by a thud on the hull of our boat more than 1,000 miles from land to find we were surrounded by pieces of plastic. The nearest other people were in orbit on the international space station. Yet here was evidence of human life, and waste, all around us in one of the most remote parts of our planet. As sailors, we experience some of the most beautiful areas of our world from arguably the best viewpoint – on the water. 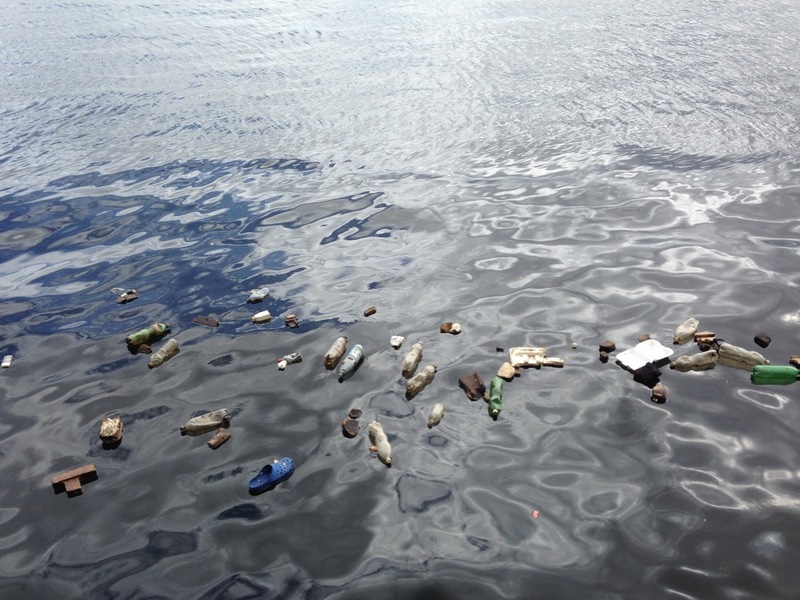 However, the truth is that much of the water we sail is contaminated by man-made plastic and chemicals. Most of it can’t be seen from the surface by the naked eye, which makes the seas appear cleaner than they actually are, and means that a large-scale clean-up is an immense challenge. As humans, we love plastic – it’s a great resource. Relatively cheap to create and transport, it’s a strong and adaptable material designed to last forever. The problem starts when it has to be disposed of. Studies suggest we have made nine billion tons of plastic since the 1950s, and all of that plastic is still somewhere on this planet. It is estimated that only nine per cent of global plastic is recycled. Unfortunately, a large amount of it ends up in our oceans – accidentally or intentionally. For many remote communities, disposing of plastic at sea has unfortunately been the most practical solution for waste management. Once plastic leaves land it moves with the ocean currents and accumulates in five hot spots, known as the five subtropical oceanic gyres. Despite theories of ‘islands of plastic’, the reality is that the plastic is smaller than expected. UV light photo-degrades it into tiny fragments. Some sink, some are ingested by marine life. All over the world, eXXpedition, the all-women sailing organisation I co-founded, has discovered these tiny fragments of plastic – including in the water surrounding the UK. This is not just a tropical-island problem. I’m sure we’ve all heard of, and maybe even seen, marine mammals, birds and fish impacted by the existence of plastic in our oceans. Entanglement is a common problem, as is the less visible ingestion of plastic that can lead to starvation of adults and young. Plastic fragments have been found in shellfish and other marine life at the base of our food chain, and it’s likely these toxics are making their way into our bodies. I decided to have my blood tested to find out what toxic chemicals I have inside me. Working together with the United Nations Safe Planet Campaign, the first eXXpedition crew chose to test for 35 chemicals that are all banned because they are known to be toxic to humans and the environment. Of those 35 chemicals, 29 of them were inside my body. The concentration of the chemicals was not alarmingly high but it’s a chilling indicator of where society might be heading. Despite the breadth of the problem and the naysayers, there are plenty of things we can all do to make an impact on plastic pollution. The issues are complex, but the more time I spend at sea, the more I realise that solutions start on land. There are ways to tackle the problem at every level – from source to ocean. These include innovation in product design to more effective waste management. As individuals, we can take simple steps such as bulk-buying boat provisions in reusable packaging, educating ourselves on waste management in the ports and countries we visit, and setting an example for others around us by buying from companies that are reducing their plastic use. As well-travelled members of various nations, we can lobby for better government action and legislation to stem the flow of plastic into society and, inevitably, into our oceans. As company directors, influential employees and educated consumers, we can challenge businesses to do things better, such as implementing company-wide sustainability initiatives, redesigning products and taking responsibility for their waste and products at end-of-life. The truth is that to solve all these problems, we have to turn off the tap at source. If we want to continue to rely on the ocean as a source of recreation, food, energy, transport and minerals for generations to come, we have to stem the flow of waste and devise more sustainable ways of using this vital resource.